The origins of Islam in Chile are not very clear. It is known that in 1854 two “Turks” resided in the country, a situation that was repeated in the censuses of 1865 and 1875. Their country of origin is not known, just that they were natives of some territory of the immense Ottoman Empire. According to the 1885 census, the number of “Turks” had risen to 29, but there is no precise information on their origin and their faith, since religion was not included in that census. However, the census of 1895 registered the presence of 76 “Turks”, 58 of them Muslims. They lived mainly in the north of Chile in Tarapac?, Atacama, Valparaiso, and Santiago. In the census of 1907, the Muslims had risen to 1,498 people, all of them foreigners. They were 1,183 men and 315 women, representing only 0.04 percent of the population. This is the highest percentage of Muslims in Chile’s history. In 1920 a new census showed that the number of Muslims had decreased to 402, with 343 men and 59 women. The greatest numbers were in Santiago and Antofagasta, with 76 in each province. In Santiago, the first Islamic institution of Chile, the Society of Muslim Union of Chile, was founded on 25 September 1926. Later, on 16 October 1927, the Society of Mutual Aids and Islamic Charity was established. With the 1952 census, the number of Muslims had risen again to 956. The majority lived in Santiago, with others in the provinces of Antofagasta, Coquimbo, Valpara?so, O’Higgins, Concepci?n, Malleco, Caut?n and Valdivia, without much organization among them. Their numbers decreased again, so that by 1960 there were only 522, with the majority of 209 living in Santiago. A decade later, the number of Muslims had increased to 1,431. However, the census did not indicate whether they were men or women, nationals or foreigners. Nevertheless, they were spread throughout the country. Through the 1970s and ‘80s, there were no religious leaders or centers for praying. Muslims who maintained the faith met in the residence of Taufik Rumie’ Dalu, a trader of Syrian origin. In 1990 the construction of the Al-Salam Mosque began, the first of the country. 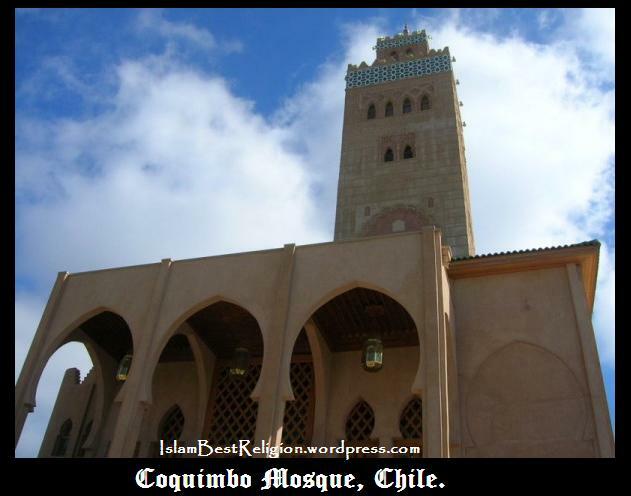 In 1995 another mosque was inaugurated in Temuco, and 1998 a new one in Iquique. Sources of the Islamic community indicate that at the moment, in Chile, there are 3,000 Muslims. Many of those are Chileans who, as a result of their conversion to Islam, have even changed their names. In spite of the small number of believers, they are not a homogenous community. The majority are Sunnis, and the rest are Shiites. Sufi groups have also arisen, but their members are mainly of non-Arab origin. “I’ll never forget that day,” says the imam of Al-Salam Mosque, Sami Elmushtawi. “The day of the mosque’s inauguration was a day where the dreams of the Muslim community became true.” The Egyptian imam says further, “For us this was a unique opportunity, because not every day we are visited by kings, nor mosques are inaugurated either.” Apart from the fact that the King of Malaysia inaugurated the mosque on 1 October 1995, the mosque is considered one of the three best ones of Latin America, after those of Venezuela and Brazil. The mosque, built to welcome 500 people, consists of three floors. The first has reading rooms, multipurpose hall, baths and cafeteria. The second contains the prayer hall, and the third has the office of the imam and rooms for guests. “There are some people who come to pray during the day, but due to work the majority come to the mosque in the evening,” indicated Sami Elmushtawi. However, Santiago is not the only place where Muslims can practice their faith. The Islamic Chilean Corporation of Temuco, founded in October 2001 in the city of Temuco, has the mission of spreading the Islamic culture and traditions. In addition, today it tries to open more channels to spread the moral values of Islam, overcoming the prejudices after 11 September 2001. Muslim women pray at the mosque and in their houses. Chileans converted to Islam describe how they live as Muslims in a country which is dominantly Catholic, and how they are perceived. The attack of 11 September generated insults and practical jokes against them. Karima Alberto, a 35-year-old housewife married to a Syrian merchant, has two children. She met her husband in his store. “He was the reason I converted to Islam, he told me marvelous things about Islam so I began to go to the mosque and learned more about Islam. It was like self-discovery,” she says.